Seneca Mill Press LLC is proud to release a masterful 4-DVD set of U.S. Mint Assay Commission records from 1800 through 1943. 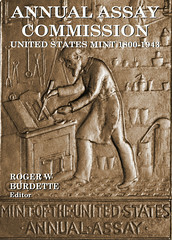 Annual Assay Commission � United States Mint 1800-1943 edited by Roger W. Burdette includes nearly 2,000 high resolution images of original Commission meeting minutes in convenient PDF format. Astute collectors know the Assay Commission records are a gold mine of information about rare and mysterious coin issues. Yet, only a few privileged researchers have ever examined even small portions of these hand-written volumes. This is the first and only published edition of these invaluable historic resources. Selected Mint documents from 1786 to 1795. Assay Commission minutes from 1840-1943 are in separate files for convenient copying to any personal computer. Additionally, all files are organized by coin date, rather then the date of the Commission meeting. Prepared by numismatic research specialist Roger W. Burdette, this definitive collection was compiled and edited over a period of more than three years. Original documents from the National Archives in College Park, MD and Philadelphia, PA, and the Library of Congress were photographed and adapted for publication. With few exceptions, images are of manuscript and typescript meeting minutes. Although not directly searchable, these image files are easy to use and print for personal use. Annual Assay Commission � United States Mint 1800-1943 is available in a special first edition to readers of The E-Sylum for $25 postpaid until November 10, 2010. The regular retail price is $75. To order send check or money order for $25 to: Seneca Mill Press LLC, PO Box 1423, Great Falls, VA 22066. Like many collectors, Roger W. Burdette began the hobby of coin collecting by attempting to fill cent and nickel albums from pocket change. During the 1970s he specialized in coin photography and produced the images for popular advertisements and hobby books. After a pause of several years, Mr. Burdette became interested in numismatic research. During more than seven years of research he has uncovered a wide array of new information including many previously unknown events. Mr. Burdette is the author of three critically acclaimed numismatic research books: Renaissance of American Coinage 1905-1908, Renaissance of American Coinage 0916-1915and Renaissance of American Coinage 1916-1921. Each book was awarded the prestigious NLG Book-of-the-Year Award. The trilogy covers the origin, design and initial production of our nation�s most beautiful coinage. He is also the author of A Guide Book of Peace Dollars released by Whitman Publishing in November 2008. He has written numerous articles for Coin World magazine Coin Values magazine, Coins magazine and The Numismatist. He is a contributor to the Guide Book of United States Coins, the 8th and 9th editions of J. Hewitt Judd�s United States Pattern Coins, Experimental and Trial Pieces, and the USPatterns.com website. He has also contributed to Whitman Publishing LLC books on double eagles, nickels, type coins, silver dollars, quarters and others, and contributed to David Lange�s Complete Guide to Buffalo Nickels. Mr. Burdette lives near Washington, DC with his daughters and canine editorial advisor, Ivan. He is employed by a nationally known nonprofit research and development corporation. 17th Century Engraving of the St. Patrick�s Coinage. An exceptionally fine example of this numismatic landmark work, with a remarkable pedigree. From the library of Rogers Ruding, it was purchased by Edward Hawkins on November 27, 1838 at the auction sale of coin dealer Matthew Young. Beyond comprising the first major history of English medals written in English, it is also thought to be the earliest publication to depict a St. Patrick�s copper.